Join us at the basic membership level that fits you best – Individual, Institutional or Corporate. For additional benefits and recognition, increase your contribution. Each level includes additional benefits through Gold, Silver and Bronze. 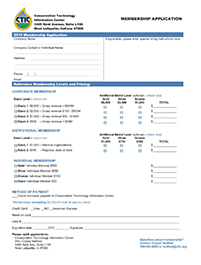 Please identify which category applies to your business to find your basic membership fee. To upgrade to medal-level membership, add the amount in the appropriate box below. Institutions, Associations, NGO’s, Nonprofits, Media, University, and more. If you are unsure if the Institutional Membership is the best fit for your business, please call us to find out the membership package that is best for you. 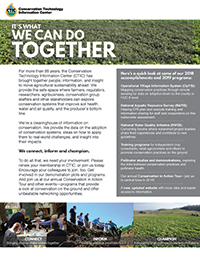 By becoming a member of CTIC, you'll be connected to a world of people from government, academia, agribusiness, the supply chain, and the farm who are committed to practical, productive conservation farming systems. Contact Crystal Hatfield, hatfield@ctic.org, for more information on becoming a member. And, through our network of agribusiness, associations, researchers, scientists, media, educators and ag advisors, we distribute information quickly and reliably. With our solid, active and dedicated membership, we demonstrate the value of public/private partnerships, and prove that more can be done together than alone. Without an active membership, we would fail in our mission to improve the relationship between agriculture and the environment. CTIC provides reliable information to its members to support environmentally responsible and economically viable decision making in agriculture. By accessing our network of agribusiness, associations, researchers, scientists, media, educators and ag advisors, we distribute information quickly and reliably.